I am not lying when I say this book is better than Gone Girl by Gillian Flynn. Poverman gives us a situation and set of characters as mysterious and intriguing as Flynn does, he surprises us just as much, and we are as riveted to the author's slow unraveling of the main players' psychologies. 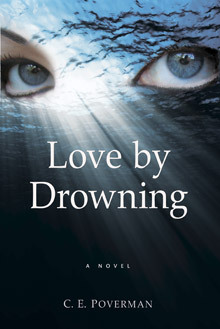 We keep reading Love by Drowning because ultimately we must know about Davis and Lee Anne. We are as defenseless against their allure as is Val, and we will read on till we've been given the scenes with which to make sense of their tangled and dangerous triangle. …Poverman invents characters we actually care about. Magnificent in its conception and precisely detailed in its execution, Love By Drowning is a disquietingly obsessive psychological mystery of two brothers, Val and Davis,whose fates, set in motion early by their father, are tragically altered by their involvement with Lee Anne, a mysterious and charismatic woman. Poverman is a writer of such range and power, and of such oneiric strangeness and metamorphosis that at times the writing carries the force of myth. I disappeared into the world of the novel right from the beginning, and I haven’t had that experience in a long while. C. E. Poverman’s Love by Drowning is a wonderful novel. The first few pages will stun you (go ahead, read them now), and it never lets up. The characters are complex and compelling. Lee Anne Wilder is tragic and frightening, and Val Martin is a terrific, complicated character. C. E. Poverman is a superb writer. Read this book. C. E. Poverman’s great subject, memorably rendered in his 1989 novel My Father in Dreams, is fathers and sons. In Love by Drowning he gives us two brothers, each the secret sharer of the other’s troubled life, whose fates play out in palimpsests of father–son dynamics. Enter Lee Anne, the woman who binds and divides them. She’s a shimmering Cubist vision of asymmetrical angles and planes that don’t quite fit, a major confusion in the atmosphere whose promise of ruin and death proves irresistible to them both. Love by Drowning is a noir thriller on its surface, but that reflective boundary of light and shadow offers sudden transparencies, glimpses of a sea bottom far below where the outlines of what has floated down stand revealed in microscopic, heartbreaking clarity. This novel lives in its bravura oceanic style that immerses the reader sentence by sentence, paragraph by paragraph, in the “secret rhythms of ceaseless tides”—not just of a sailor’s Atlantic (Poverman’s epic descriptions of marlin fishing will make you forget Hemingway) but the tangled undertow of human relationships in all their confounding mystery. In this powerful, beautifully written, and haunting novel, C. E. Poverman explores the murky and alluring waters where past and present merge, taking down life’s sailors as they fight for air and offering salvation when the storm subsides. Who is left standing and how did that happen? Those are the questions posed here, and Poverman’s ability to tell a story in unexpected ways and get inside his characters—male and female alike—make Love by Drowning an irresistible siren call. The volatile bond between two brothers and the mysterious woman who consumes their lives drive Poverman’s superb fifth novel (My Father in Dreams). Val and Davis Martin, long separated by circumstance and the crushing weight of paternal expectation, have reunited in North Carolina to assist in a marlin fishing tournament. After shady dealings in Miami, Davis is accompanied by his girlfriend Lee Anne, a hairstylist who reads Chaucer. But a small act of betrayal leads to tragedy in the water and Davis dies during the competition. Seventeen years later, Val has reemerged in Arizona as an art teacher with a wife and sullen teenager but is still receiving postcards from Lee Anne with cryptic messages such as, “I forgive you nothing.” As if by fate, Val finds himself caught in a tangled web of revenge and murder as Lee Anne, a woman of no compunction and no past, lures him in. Verdict Deftly blending the lyricism of literary fiction (featuring some of the most vivid descriptions of fishing this side of Hemingway) with the spareness of noir, Poverman has fashioned an acutely intelligent psychological thriller that will keep readers as off-balance as his protagonist.